My experience as an Education intern for ArtPrize has allowed me to see the different ways that ArtPrize opens up dialogue and takes the intimidation away from the arts for people of all demographics—whether it be by location of artworks, methods of digital communication or personal interactions. Despite the fact I’m not pursuing a career in arts education (I’m a Business Management and Art History major at Grand Valley State University), my experience with the Education team has connected to my studies with lots of planning, prepping and facilitating events throughout the community of Grand Rapids. Through this I’ve learned that a key takeaway from ArtPrize is that visitors don’t have to attend a traditional gallery setting to experience art. The ArtPrize experience brings in all different types of works of art in both expected and unexpected settings. It facilitates meaningful conversations between artists, art enthusiasts and the community outside of the arts—including children and people across all socioeconomic levels. It breaks down the barriers and the intimidation surrounding art and the creative community. UICA’s ArtPrize Exhibition ‘UICA Outside’ exemplifies this sense of open boundaries. 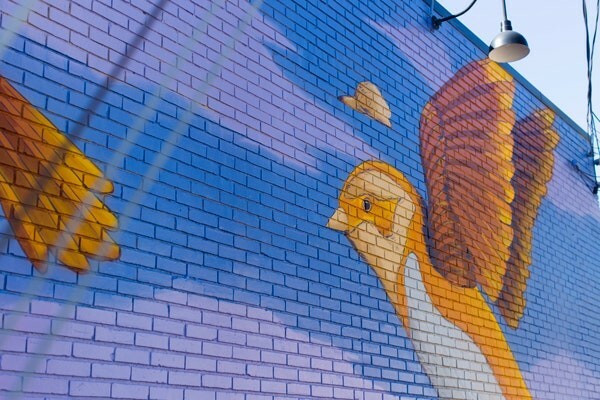 ‘UICA Outside’ is city-wide and accessible to all via outdoor murals placed in five different neighborhoods of Grand Rapids. This exhibition has the ability to have the same impact on an intentional ArtPrize visitor and someone who may accidentally see the art on their daily commute. These chance encounters can lead to conversation around the office water cooler, with your friends the next time you grab a coffee, or digitally. There is no denying that we live in a digital world, where everyone is glued to their phones and their social media accounts. Instead of keeping people away from the arts, it in turn allows for dialogue. With many works on view addressing social and political issues, it has the power to resonate with people around the world as well as allowing for the education of those unaware of these issues. 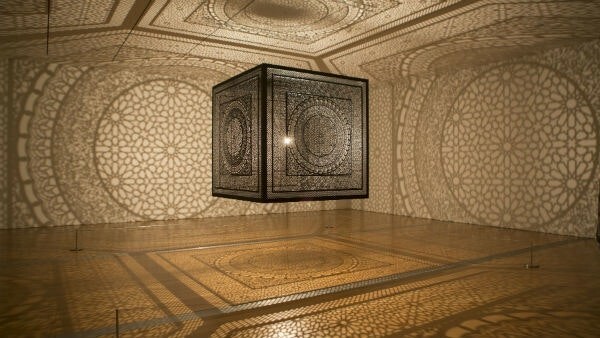 For example, the work Intersections by Anila Quayyum Agha, a past ArtPrize grand prize winner, was created as an inclusive space open to all in response to her experience of being excluded from mosques for being female. People all over the world have felt exclusion in one form or another, sharing this digitally could allow for someone in New Zealand, for example, to appreciate and resonate with the work. ArtPrize brings people together! How else does ArtPrize foster conversation? Children are another example, not all K-12 students have the opportunity to have arts integrated into their school curriculum. Children residing in the surrounding area, or children that have had the opportunity to travel to Grand Rapids numerous years since ArtPrize’s inception in 2009, have been exposed to the arts while their minds are still in their developing stages, and they are experiencing the world around them in a different way. Art education and experiences foster communication skills and appreciation for the arts. 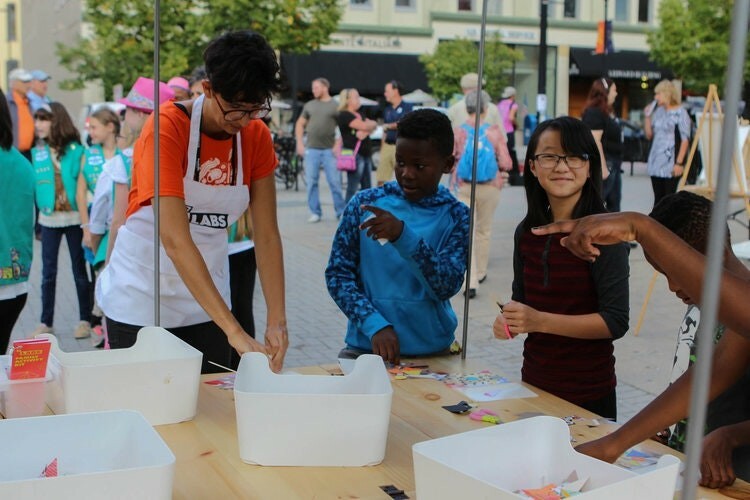 As an intern, working with the ArtPrize Mobile Workshop at many community events with pop-up art making activities, I was able to see children interact first hand with art—some as young as three years old. Within the Education Department at ArtPrize, we strive for art to be experienced. We aim for individuals of any age to unleash their creative side by completing free activities that are easily reproduced at home or in any setting. Such activities include ArtPrize’s Discovery Deck, a set of 12 creative challenges that celebrate past ArtPrize-winning entries. These activities will be available at the ArtPrize STEAM Lab and the Mobile Workshop during the event. These activities can also be copied or adapted for enjoyment at home and can be assembled using household or recycled materials. This educational material is free for all and PDFs of all 12 postcards can be downloaded here. Come out and enjoy creating at the ArtPrize STEAM Lab at Rosa Parks Circle and around the city at the ArtPrize Mobile STEAM Lab and ArtPrize Mobile Workshop during the 19 days of ArtPrize!